Sleep Apnea Makes Quick Comeback When Breathing Treatment Stops : Shots - Health News When patients stopped using a continuous positive airway pressure machine to treat sleep apnea for one night or more, not only were they sleepy the next day, but a flood of related health problems returned, a study found. 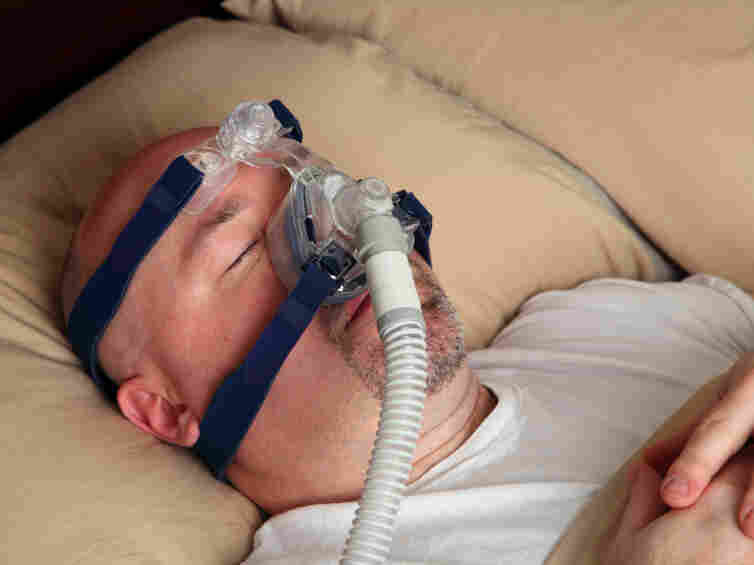 Many people with sleep apnea wear a CPAP machine mask in bed to help them breathe. If you use a breathing machine to treat your sleep apnea, it's probably a bit clunky. But it's also probably doing you a lot of good. In a small study, researchers at the University Hospital in Zurich, Switzerland report that when patients stopped using continuous positive airway pressure machines, or CPAP, for one night or more, not only were they sleepy the next day, but a flood of related health problems returned. The findings appear online in the American Thoracic Society's American Journal of Respiratory and Critical Care Medicine. Those findings make a lot of sense, says Dr. Nancy Collop, medical director of the Emory Sleep Center in Atlanta. She likens the CPAP machine to blood pressure medication. If you stop taking your medication, your blood pressure rises. If you forget to use your CPAP, your sleep apnea will return. Patients with sleep apnea can awake hundreds of times during a night, gasping for breath and never really getting a good night sleep. The breathing machine helps patients by pumping air directly into their obstructed airway, essentially forcing them to breathe regularly. What was surprising in the study was just how quickly problems returned when patients went off the machine. Researchers divided patients into two groups. One used their breathing machines as usual. The other was taken off their regular machine and given another one that pumped less air, making it ineffective. After two weeks, the group on the ineffective breathing machine experienced a return of a number of health problems related to apnea. Researchers found a marked increase in blood pressure and heart rate, as well as increased dysfunction of blood vessels inside the heart and certain hormones related to heart disease. CPAP withdrawal leads to a return of obstructive sleep apnea within the first night off CPAP, researchers say. Dr. Collop says that because the CPAP machine can be cumbersome, most patients at one time or another will ask her if they really need to wear it every night. But over the years, the machine — which was once the size of a suitcase — has been re-designed and is now about the size of a square box of tissue. Even so, "CPAP is a treatment, not a cure," she says. "Unless it's on your nose or over your face, it's not going to be helping you when you're sleeping."